We live in a world where you can order Girl Scout Cookies online. Obviously, it's a wonderful place -- but cookie season doesn't last forever. And once you're done with the hoards that you stored away for this cold, harsh winter, where will that leave you? Without the intoxicating presence of Thin Mints, Trefoils, and the rest of the Girl Scout lineup, that's where. But now you can simulate it... with candles. And, uh, air fresheners. That's right. 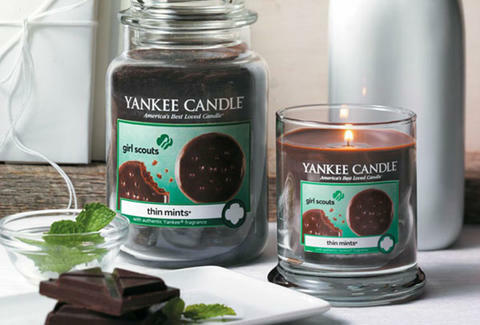 Yankee Candle and the Girl Scouts have teamed up to make it feel like you're living in the Girl Scout Cookie bakery all the damn time, and that's pretty considerate of them. The candles and air fresheners come in Thin Mint, Trefoil, Chocolate Peanut Butter (Tagalongs), and "Coconut Caramel Stripes" -- which, depending on where you're from, you might know better as Samoas or Caramel deLites -- varieties. You can purchase the candles or air fresheners right here, where they'll be available until April 2015. Just make sure they last you until next cookie season. Adam Lapetina is a Food/Drink staff writer for Thrillist, and would never get anything done if he actually lived in a bakery. Read his musings at @adamlapetina.